It’s fall, y’all! And look what I’m giving away! Just in time for the holidays! 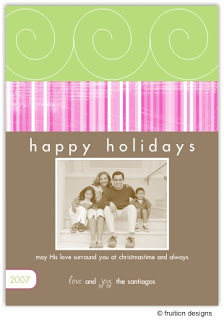 25 personalized Christmas/Holiday cards. Each card is personalized with your greeting and photo. Comes with plain white envelopes too. (A $50.00 value!) I am still rolling out some new designs this week, so check back at my business blog for updates on new designs. This giveaway is open to participants in the US and Canada. For your chance to win, head over to my business (Fruition Designs), take a look around, and then come back and tell me your favorite card design (don’t worry – you can change your mind if you win!). I’ll leave the comments open until this Saturday, November 3rd. Then I’ll use a random number generator to draw a winner. *Also – I am offering a 20% discount on holiday cards and a 15% discount on orders of 100 Mommy Cards from now until November 6th. So, if you don’t win, you can still get a great deal on some great looking cards! Just use the code BG20 for the holiday cards and BG15 for your mommy card order. I am also giving away a gorgeous purse, made by mom. Head over to this post to see it and enter that contest. What a fabulous giveaway. please enter me! I’ve seen your site before and LOVE your cards. Flurries and snowfall are my favorite Holiday cards! Oh enter me please! So adorable. Well, that is a tough one. I think I have it narrowed down to three. Can I think about it? Pull my name and I’ll decide in a jiffy! Thanks for including such a beautiful give-away. what would be better than gorgeous cards like that? I love the Retro Holiday ones! Please sign me up. Oooh, Icicles or Snowfall has to be my favorite. Thanks for the chance to win! cool…my favorites are flurries and snowfall (I think was the name)…that would be a hard choice! What a great giveaway. Please count me in. Enter me!! I love your work! I pass out my mama cards and people think they are sooo cute!!! What a wonderful giveaway! You’re so talented! I like the snowfall design–but they’re all great! I like the reason for the season holiday card! Count me in. Thanks!! Love, love, love Christmas blush! Very cool! Love the snowfall design-so cute!! I vote for Christmas Blush. Lovely cards. I like the Miracle Birth. Please enter me. I love the miracle birth card. So neat to find your blog. I’ve read some of your comments over at Fried Okra. I feel like I know ya but just haven’t been to your blog. I’ve bookmarked it now, so I’ll continue to visit! I love the “Reason for the Season” cards. I like the Miracle Birth cards! Count me in I loved the pink and green Happy Holidays….. I love the snowfall one! I like SnowFall and Christmas Blush. It would be so hard to decide. Love Snowfall and flurries– all are fabulous!! enter us please-we love it!! I love Flurries, but since I won’t get any in Florida, I better go with Christmas Blush – all are so cute – hard to decide! Pick me…I would love to get a jump start on my cards. ME ME ME!!!!!!!! cute stuff! Ooooh. I love your new header. And I love your cards. I’m in!! I like flurries. I like icicles. I like snowfall. Karla, really, they are ALL gorgeous. If I win, I have no idea how I’ll decide. holy star is for me! flurries is too cute. :) Love your blog by the way. I like the Retro Holiday design! Very cute! What a wonderful giveaway! Count me in please and thank you! Mine is posted as well! Hugs! Count me in please! I LOVE the Snowfall design. Those are way cute! You are talented. I like the flurries, I think. Great giveaway! I like Snowfall the most. I love the Flurries and the Holy Night! i like the retro holiday cards. I like the FLURRIES one. Too cute! I love the brown and flakes Christmas card. Those are so cute! Please enter me. Sounds great. Your designs are amazing! I would love a chance! I love the Melissa Mommy cards!! I love the retro holiday cards, I hope I win! I love “icicles”. Great preppy colors! Of all your designs, my favorite is Holy Star, Karla. But if I win this giveaway, I’d go with Snowfall because it’s lovely, too, and can be personalized with a photo. All your designs are great. I like the snowfall. Count me in! I think I like the snowfall! Please count me in! reason for the season is my favorite. Count me in, and come enter mine, too! I think I really like the Snowfall design. They are all so pretty! Holiday cards! Yippee! Please, pick me! This sounds maaaah-velous dahling! Put me down . . . I need some new note cards. I like the Snowfall Holiday cards! Please count me in! I love snowfall and Christmas blush– mostly because I have six kids to fit into the photo and horizontal photos work best… can you tell I have put some thought in this?? Please count me in! I like the Holy Star style. Such lovely designs. I’m liking snowfall right now. It’s hard to decide, but I think snowfall is my favorite. Flurries is my favorite…I love blue and green! They are all beautiful. Thanks! i love love LOVE miracle birth. you have such a gift friend. could you enter moi? thanks! I love the snowfall design! I really hope I win, this is a wonderful giveaway. Wow your cards are amazing! It’s SO hard to choose just one design, but I think I would have to go with Snowfall! Thanks for offering these! Help with my Christmas card would be so great! I love holy star but they are all very beautiful. I would love to win this great giveaway! I think snowfall would have to be my favorite. I love icicles! Please enter me! I could definitely use this! Thank you! but really, deciding is hard! Retro Holiday is my fav! Icicles and Flurries are my favorites. Beautiful cards…I hope I win! I like Miracle Birth and Joyous Holiday. Personally, I like Christmas cards with traditional Christmas colors. Thanks for the chance to win. I really like snowfall or reason for the season. How much fun. Thanks for the chance. Hey Karla – I like the snowfall design. Count me in! I love all of your things – especially the icicles card and the Christmas retro. And I just adore most of your mommy cards. I don’t know which one is my favorite. Please enter me. I like the retro holiday, fun prize! Hmmm..I really like icicles! Great giveaway! I may not have time to make my own cards this year so this would be a lifesaver! I’m digging the retro holiday card right now. Cute designs! I love the holy star design and the snowfall design… so cute! Miracle birth and Snowfall! Please enter me! Hard to choose – I like the Christmas Blusha and Holy Star – I’m bookmarking your shop for future reference! We’re having a new baby right away and this would be fantastic for Christmas cards this year! I love snowfall, but it was a tough choice and would be happy with any of them. Thanks for sharing! Snowfall for sure. Thanks for the great giveaway. beautiful cards! i love the “miracle birth” ones. fun, yet has the reason for the season. :) thanks for the giveaway! What a great giveaway! I really like Miracle Birth! Please enter me! Thanks! My favorite design is Snowfall! Hard to decide but I think I’m liking Snowfall best right now–so pretty! These are beautiful – we’ve just gotten into customizing Christmas cards, and these would be great! Count me in please! Oh, how fun. We just decided to do picture cards this year and this would be so fun! Love the Snowfall design! Great stuff! So many great choices… but probably the brown with the snowflakes is my favorite. At any rate, since we have a new baby this Christmas, your cards would be so perfect! I love the Christmas Blush..It must be one of the new ones b/c I don’t remember seeing it before! You have an awesome talent! Thanks for the chance to win! I like the “Icicles” and the “Miracle Birth” designs. I love hte ones with non-traditional colors like the browns and bright colors. Great giveaway, so count me in! I love the “Reason for the Season” design. Good luck to everyone! I like Flurries & Icicles. My favorite is icicles. What a great contest…you are so talented! Thanks for the chance to win! I think I like snowfall best! What a great prize! Please enter me. Definately the snowfall one. Beautiful brown! Thanks so much for the chance to win! My favorite design is “Miracle Birth.” Please enter me in your giveaway. Thanks and God bless! I really like the snowfall…beautiful cards! I think I like the retro ones..but they are all so cute. It is hard to decide. I can’t believe it’s almost Christmas! May we not forget Jesus is the reason we celebrate! Okay, so I’m on an old dial up connection here. Each time a card’s picture popped up I thought, ooo, I like that one! So, I’m not sure, but I do like the blush one. Hope I can change my mind if I win! I wish I was creative… good thing there’s people like you out there! Thanx for stopping by and entering my giveaway! Good luck with all the giveaways you enter. Please enter me in your giveaway. Thanx. I love the retro holiday and snowfall cards, but all of them are just wonderful. Thanks for including me. I’d totally have to go with Flurries, the design is cute! I love Miracle Birth. These are great cards! What a great giveaway! Please enter my name. Thanks! I like the icicles and the snowfall one. Count me in please. I love the Miracle Birth cards. Count me in! I would have to say Flurries or Icicles! I think the Christmas Blush design is darling. I like the Joyous Holiday card design best. Very pretty. All of these designs are gorgeous . . . I love Snowfall, Icicles, and the Miracle Birth – I’d welcome anything!! Again, thanks for the giveaway. great giveaway! the cards are beautiful! Love the snowfall.Please count me in. My favorite is Flurries and I love the scripture included. Lovely cards…I like the “icicle” design. Christmas Blush is so nice. Please count me in. Great giveaway! They are all beautiful! I love the Snowfall design. Wow, these are cool! I love Christmas Blush and Retro Holiday. These are rad! I like alot of them, but I like “snowfall” alot! Please enter me! Thanks for hosting a great giveaway. I like flurries. Then if I could just get my family to look as nice as your samples. :) Thanks for the chance to win. Snowfall and Miracle Birth are my favs and I would have a hard time chosing between them but would likely go with the miracle birth one. I like Christmas Blush! Count me in, please! I love this! Too cool! great designs! a truly tough decision, but I am drawn to Snowfall. Love it. please count me in. Thanks! My favorite is Snowfall. I’d love to win! Thank you. I’m not sure I can pick a favorite!! All are so beautiful. Thanks for entering me! I like the Retro holiday card.